Before I talk about my experience with this oil, I just wanted to tell you a little bit more about 'Fair Squared'. The company began back in 2011 in Newcastle (here in the UK), but have since moved their headquarters to Cologne, Germany - which is where all of their products are now made. The raw ingredients are sourced from some of the world's poorest regions - helping to support the local people to achieve economic independence and improve their livelihoods. Not only are these products helping communities worldwide, they're also environmentally friendly and none of the products are tested on animals. The whole range is free from parabens, nanoparticles, mineral and palm oils. The products are certified Halal, vegan, natural and organic. On paper, the range sounds fantastic... but does it live up to expectations? I'd have to say yes. The pure and fresh ingredients produce incredibly effective body care - plus, they're perfectly suited for sensitive skin. How about haircare? Well... let me tell you about one of the items I've been trying out: the coconut hair oil. When it comes to my hair, I've found that there is no better product than a hair oil for giving shine, hydration and an overall healthy boost to my hair. 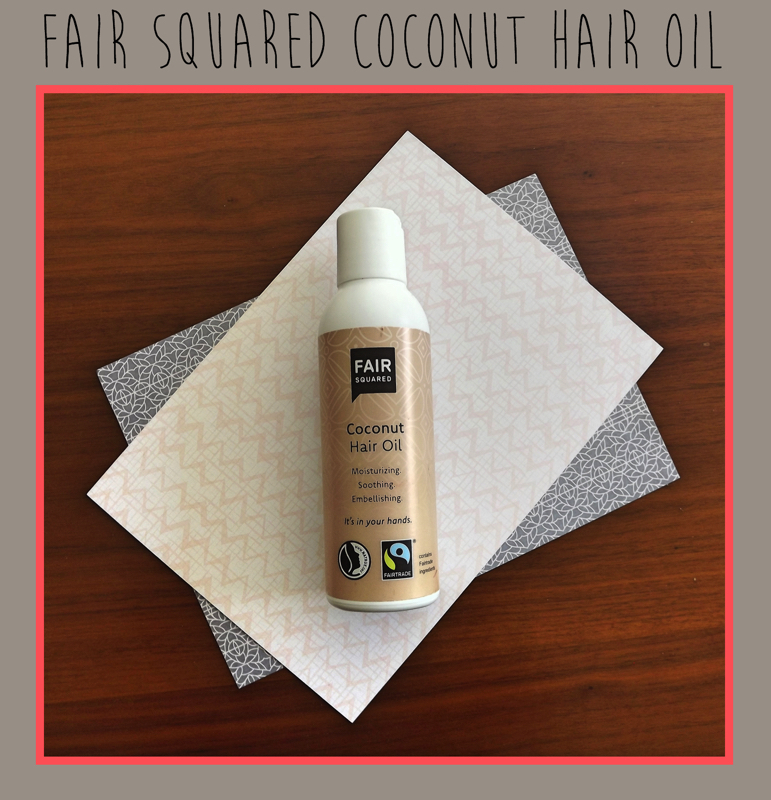 For this reason, I was really excited to try the 'Fair Squared' hair oil which combines coconut oil (sourced from Sri Lanka) with organ oil to give your hair more life. These two oils are both so nourishing to the hair (see my post on coconut oil: here) and together they're a true power couple. The oil also has added vitamin E and soy. After a shower, I'll massage the oil all over my hair (starting a couple of inches down from my roots all the way to the tips). A small amount really goes a long way with this oil; I pour a 50p size portion into one hand, share it out into my other hand and then smooth it throughout the hair strands. The one result you'll see straight away is that once your hair is dry, you'll have a noticeable shine. With a few uses you'll detect that your hair is much softer and your hairstyles will look a lot smoother. 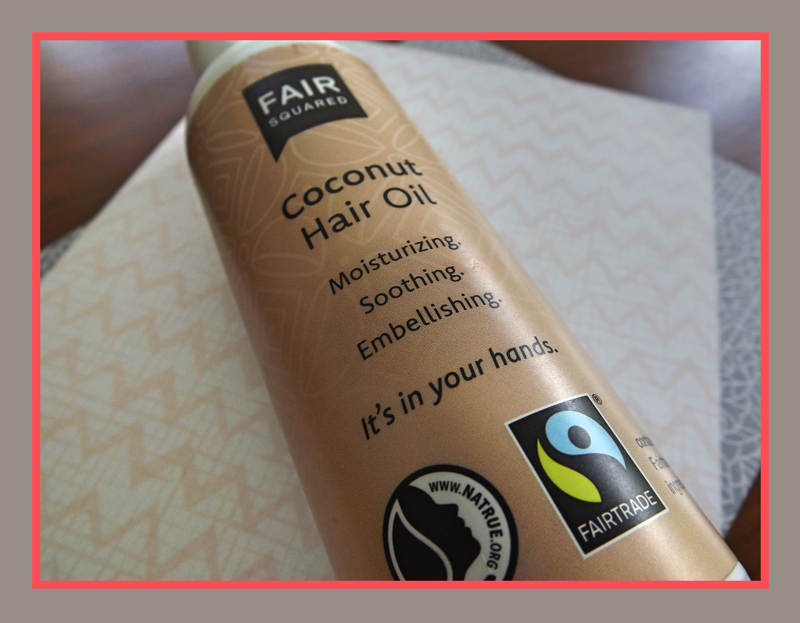 In fact, this oil is ideal for anyone with frizzy hair as it has a taming and de-frizzing effect. This oil is a staple for me now - I use it every time that I wash my hair! Additionally, if I ever feel like my hair needs an extra boost, I'll leave the oil in overnight before rinsing it off in the morning. In this way, the oil acts almost like a hair mask - giving intense hydration. If you're interested in checking out this oil, then have a look at it's product page: here.